I wanted to share these Vietnam travel tips with you, in the hope that you too can dive right into the deep end of the experiences Vietnam has to offer. Here are top things to do in Vietnam you should never miss. Two years ago I took a trip to Vietnam and Thailand with a couple of friends. We had heard so much about the beauty of Thailand’s golden beaches that we were reluctant to even make it over to Vietnam. Vietnam, the country where I was born, had become a distant memory. The longer we were in Thailand the more we felt like we were totally missing something. We wanted to experience the local culture but all we seemed to find was other tourists. We brought our flights forward and headed to Vietnam, a country where I could be confused as a local. I could speak the language and knew the culture. I was totally swept away by how much the country had changed but, at the same time, how much I recognised its soul and personality, quite unlike any other. Vietnam provided the experience we wanted from Thailand. 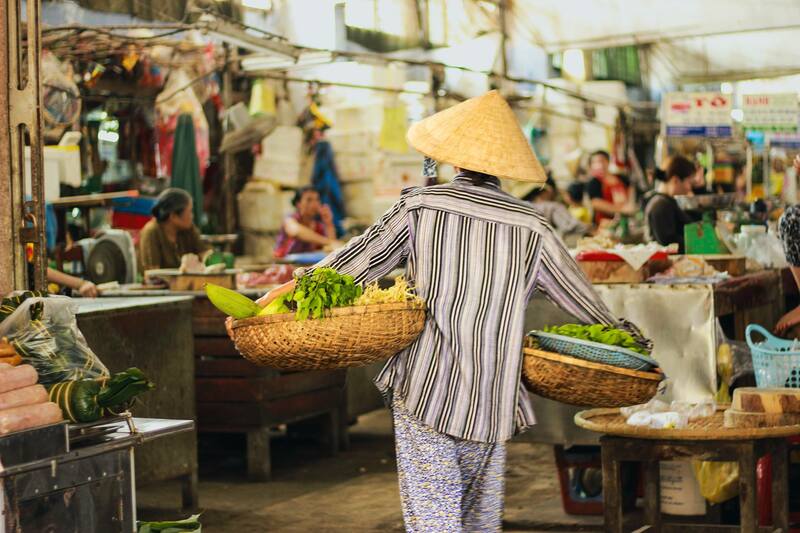 There were a few things that having previously known helped us achieve this, so I wanted to share these simple but effective Vietnamese travel tips, in the hope that you, too, can dive right into the deep end and experience what this incredible country has to offer. 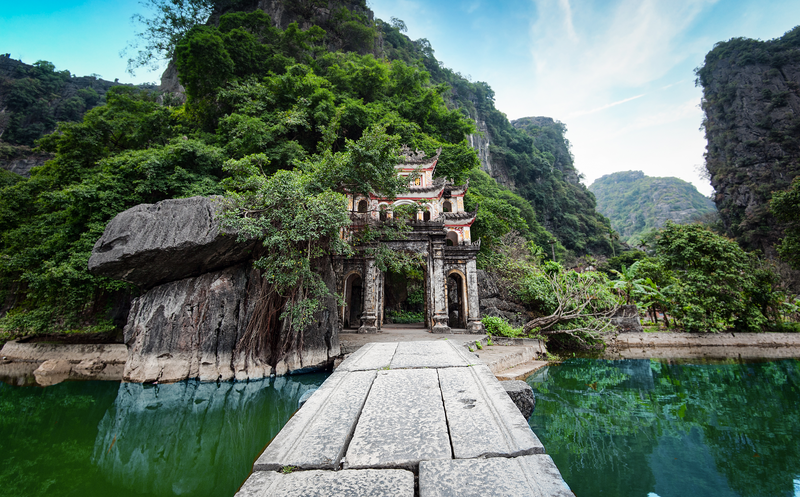 Explore things to do in Vietnam with Inspitrip now! 2. If you are from Europe, you might not need a visa. 3. Everyone is a millionaire here. 4. Exchange money at jewelry shops for a better rate, and withdraw money from Citi bank to avoid multiple transaction fees. 5. 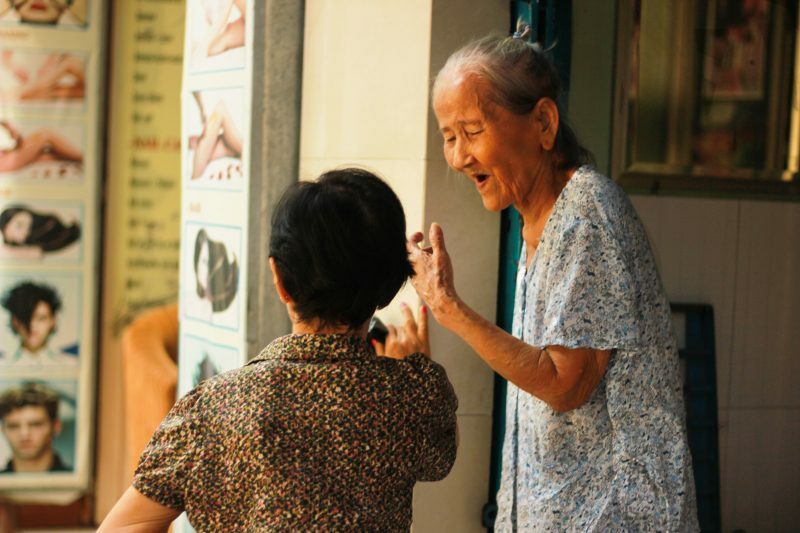 Your trip will be much easier if you master these useful Vietnamese phrases. 7. Vietnamese are friendly but money driven. 8. You don’t need to tip here. 11. Vietnamese food is amazing! 12. Shop as many sporting gears as you can. 13. Bring your fashion catalogue and make your clothes tailored here. 14. Don’t have a haircut, massage and beauty treatment before your trip. Do all of them here. My best advice is not to be put off coming in the raining season. The rain usually only happens for a few hours in the afternoon and the locals are used to carrying on with their day no matter how heavy the downpour is, so no activities will be cancelled due to it. The weather varies across the country. The northern and highland regions exhibit more seasonal trends than the likes of Ho Chi Minh City (HCMC) and the south. If you are coming here for the first time, I suggest packing summer clothes and a few light jackets for the evenings. Tet lasts around ten days. For four of them, all the shops will be closed in the main cities and hotspots such as Hoi An will be very busy. The usual bustling cities are replaced with an eerie peacefulness which in itself is a unique experience. This celebrates the Reunification Day, or the Fall of Saigon (HCMC). There are fireworks and celebrations throughout many of the cities, the most impressive being in HCMC itself. HCMC alive on Independence night. 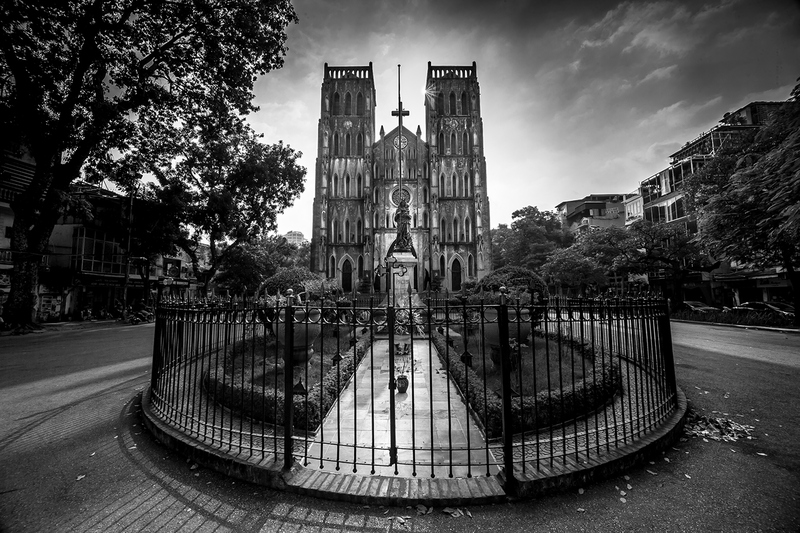 Captured by one of our guides, Nicolas, who can show you how to take the best photos the city has to offer. Hanoi looking unusually sleepy during Tet Holiday. Scandinavia, Southeast Asia, and Western Europe, get a free 15-day Visa. 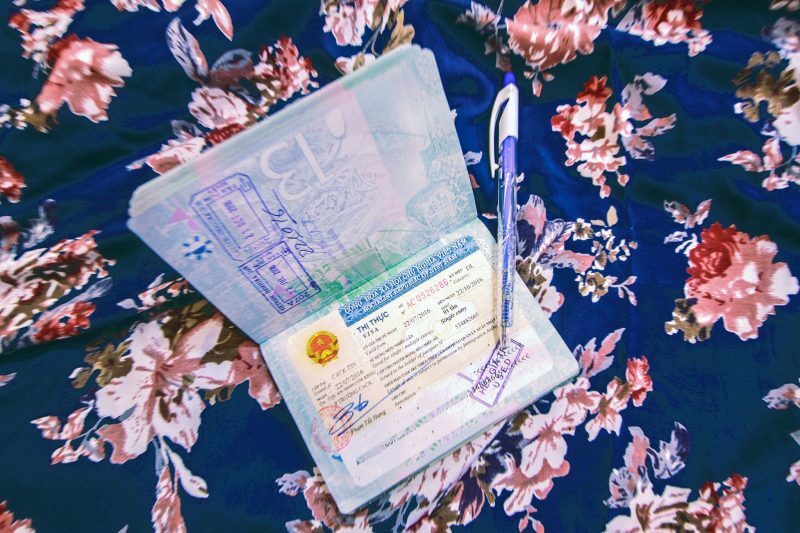 If you leave the country after or during this Visa you may be asked to wait 30 days before re-entering, in this instance, you would be better to get the 3-month multiple entry Visa online (at least 3 working days before your flight). Citizens of the United States, Canada, and Australia can apply for visa on arrival. The cost is about $45USD for a 30-day single entry visa. All information is up to date as of November 2016. Buy your 3-month visa in advance online, print it off, bring a passport photo and the $10 stamping fee. 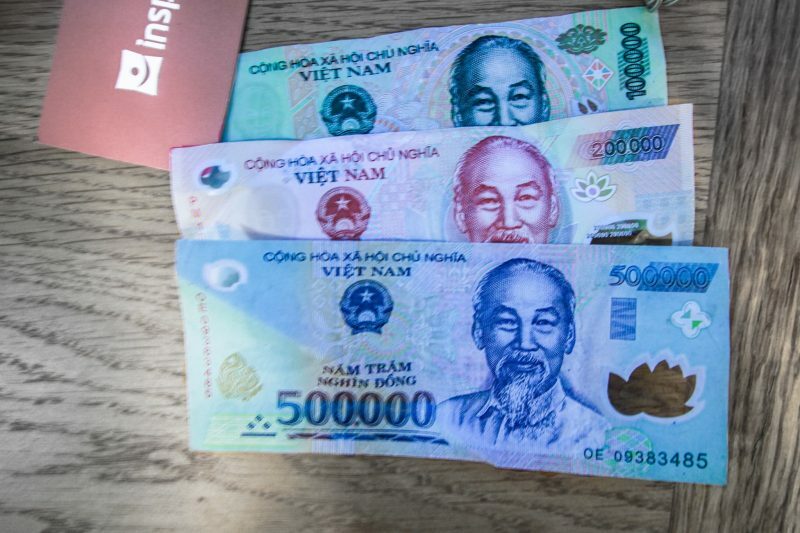 which means 1,000,000 VND is around $44, the cost of a mid-range hotel room. Vendors are not officially allowed to accept currency other than the VND so make sure not to be caught out without the local currency. All the zeros take a while to get used to. Try and get your head around the exchange rate before engaging in bartering in the markets. Bún thịt nướng, a noodle dish topped with grilled pork, can be bought for 50,000 VND (around $2). Most ATMs in the country accept Visa or Master Card. In all of the major airports there are money exchanges booths, however you can find a better exchange rate in the jewellery and gold shops in HCMC and Hanoi around the central part of town (in HCMC, they surround Ben Thanh market). Many of the local banks limit you from withdrawing more than $100USD at a time. Although, depending on your bank account, you can withdraw as much as $250USD from a HSBC ATM and $400USD from Citibank. Make sure you get cash before visiting rural areas as ATMs can be hard to come across. This photo was taken by our guide, Nicolas, at Cat Cat Village, North Vietnam. The official language is Vietnamese. Many visitors find it extremely difficult to gain a quick grasp of this language as it is tonal and requires many of the sounds to be made in your throat instead of your mouth. Here are some quick and useful phrases which may come in handy even without mastering the tones. 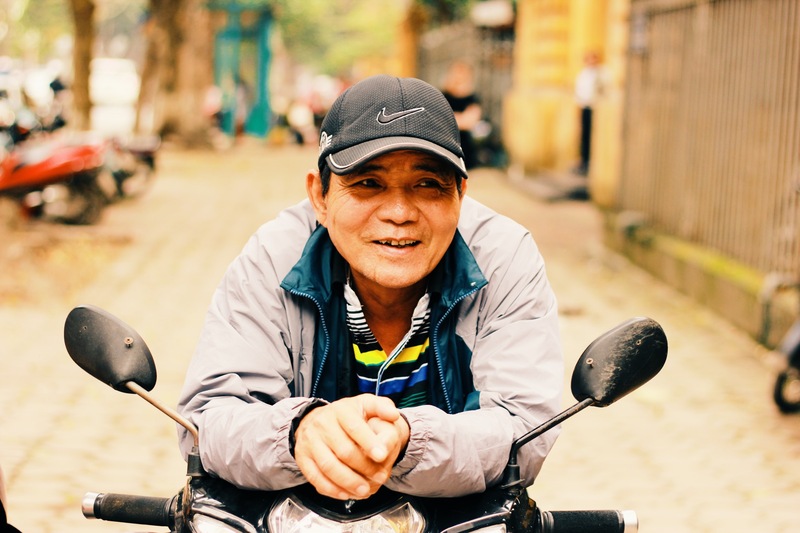 Make sure to check out our guide to learn 100 basic Vietnamese phrases as I have generally found locals are pleased to hear you attempting their language so will help you out. Excuse me waitress: Em oi! The Bill Please: Tinh tien! No Sugar: Khong suong (Khom duong) – The norm in Vietnam is to add sugar. Exploring the hidden alleyways provides a welcome escape from the buzz of motorbikes. Captured by Abi Travers. Vietnam is not only extremely cheap to visit but also relatively safe. Both locals and the government look to tourists as a sign their country is developing so they welcome their arrival. The only crime you are likely to encounter is petty theft with the most common incident being people snatching belongings while driving past on a motorbike. So, to protect yourself against this, make sure you don’t displayed obviously, avoid using your mobile phone near busy streets, and hold your camera securely when taking photos by the road. 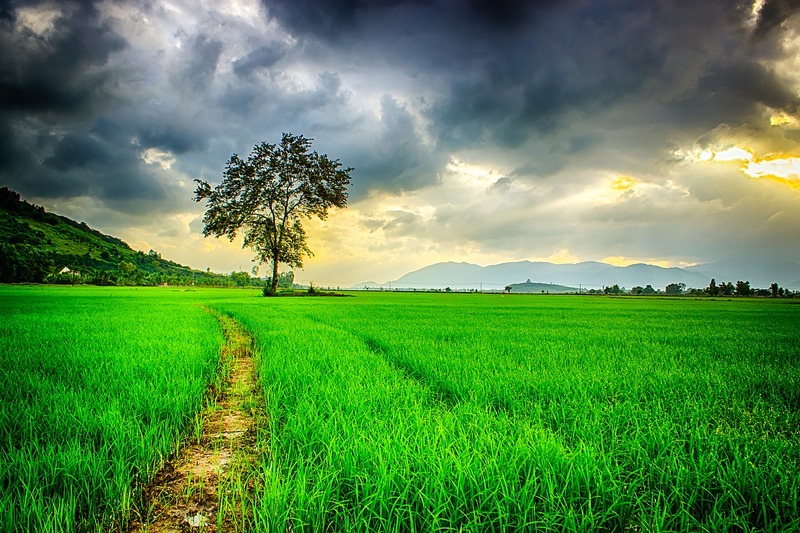 Vietnam travel tips: Crossing the road can seem like an impossible task when you first arrive. The trick is to look for a small opening, keep a steady pace and don’t make any sudden movements. After you get over the initial shock you realise the traffic is more organised than it may seem. Nothing is going too fast and the drivers are, as a whole, considerate of each other. 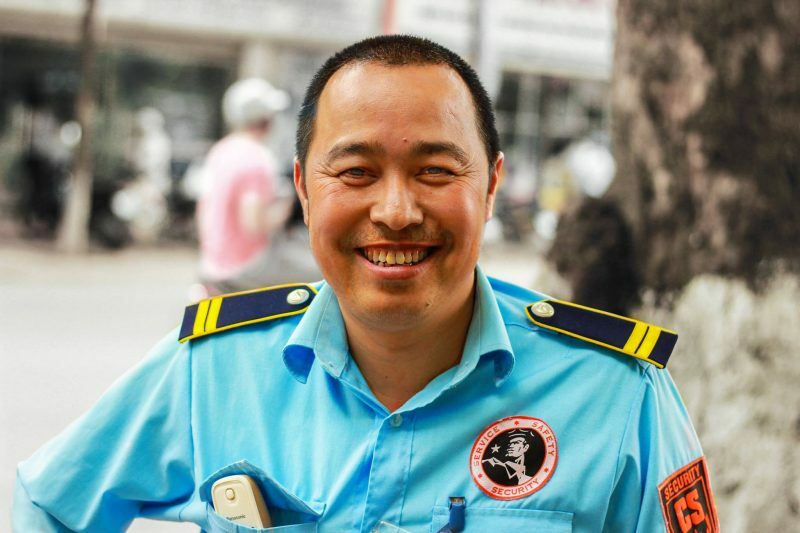 The friendly face of a security in the capital, Hanoi. Captured by Abi Travers. The Viet population stands strong at just over 90 million. It is predominately young with the average age at just 30. Education is highly valued by the Vietnamese. The older generation has been through a war and is desperate to bring the youth out of poverty. Many children attend extra classes on weekends. If you spot a large crowd of people waiting on motorbikes outside a building, you will likely soon see uniformed children running out and hopping onto the back of the bikes. A farther is waiting for his kids outside an English school in Hanoi. Captured by Abi Travers. The culture in Vietnam is quite unique to the rest of South East Asia. Influence from both China and the West has been spun into a very different way of seeing and doing many things. There are a strong determination and entrepreneurial spirit. 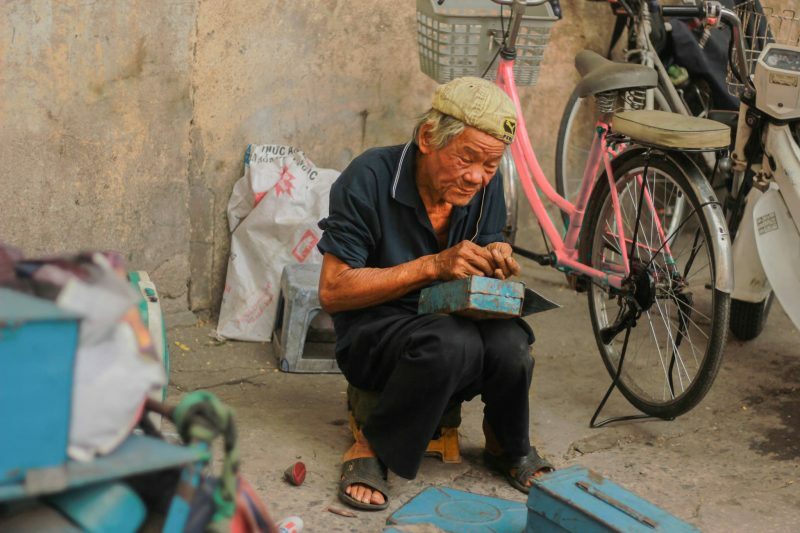 Bartering is a competitive game which is sometimes misinterpreted by visitors as the Vietnamese trying to rip them off. It is true that there is a difference in the prices for locals and visitors, but you can always get a lower price than what you are first quoted. Many of the older generations have experienced a time when food and money were scarce, so to them, visitors mean a chance to escape the hardship of the past. 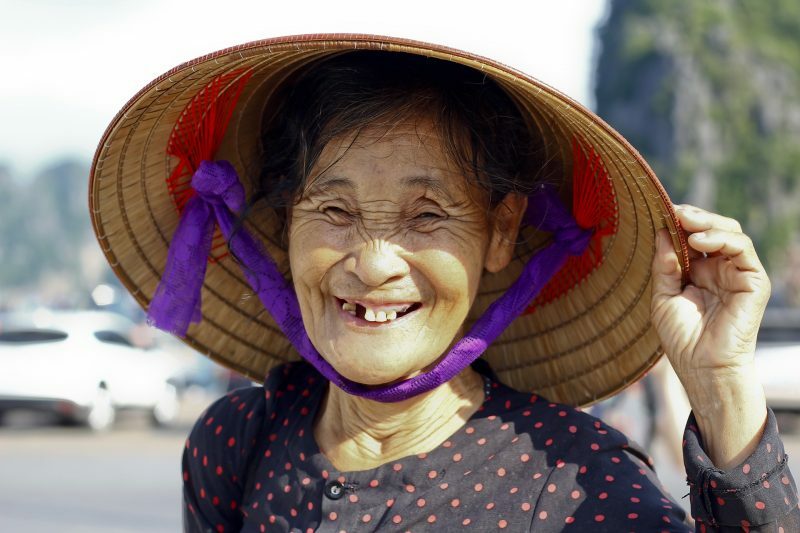 Vietnamese woman displaying the traditional conical hat. Vietnam does not have tipping culture and tips are not expected. Coming from Australia, I like to tip a little to most people when I get a good service but, like many other developing countries, there is not always good service. Vietnamese usually share their dishes so restaurants accommodate to this and bring out food as it is cooked. 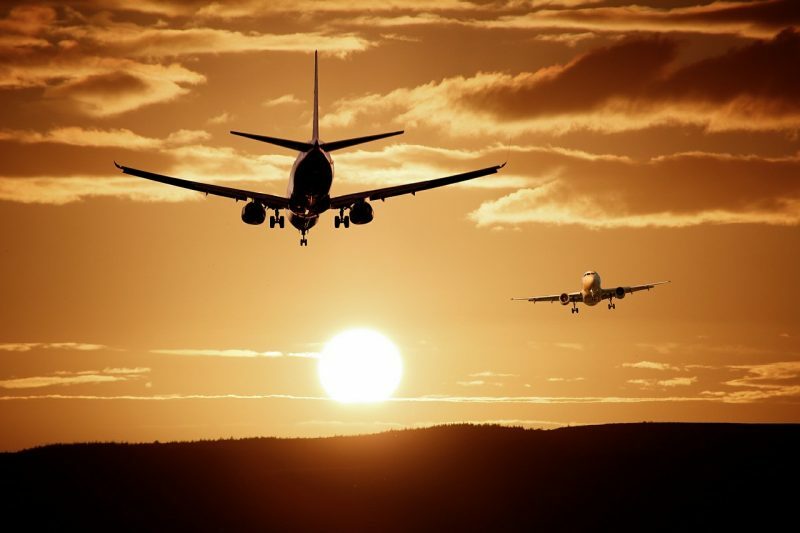 There are many domestic routes which can be an extremely affordable and quick way to travel. During the rainy season, it is common to see delayed flights, so look out for severe storm warnings in and around the country on the day of your flight. I have to admit I like to pay the little bit extra for Vietnam Airlines. It is farther more comfortable and professional than VietJet and usually provides a free meal. You can hail a taxi in most urban areas. Some visitors have reported scams from drivers overcharging so make sure you ask for the meter to be put on. A good tactic is to check prices with Uber before bartering with any other taxi drivers. As a gauge, you should not pay any more than 200,000 VND from the airport in HCMC to District 1. The traditional motorbike taxi, translated as “hug the driver” although the hug is optional, are available almost everywhere. You don’t need to look for them, they will find you; “You. Hey, you. Motorbike you?” will follow you around wherever you walk. Find the source of this sound and you will find a Xe Om. The ride-hailing app which allows you to roughly halve the price of metered taxi is only on offer in the big cities. You have downloaded the app to get this service and will need an internet connection to hail one. When it rains, demand surges and so do the prices, at this point, it is usually less costly to hail a taxi. Uber and Grab’s drivers have an incentive to offer you a good and safe service as they really want you to give them a 5-star rating on the app afterwards. In all of the above options, I have been surprised at how often the driver does not know the way and expects me to. Uber and Grab are slightly better for navigation as they have their smartphones but it is always best to check Google before you leave so you can help if your driver gets lost. 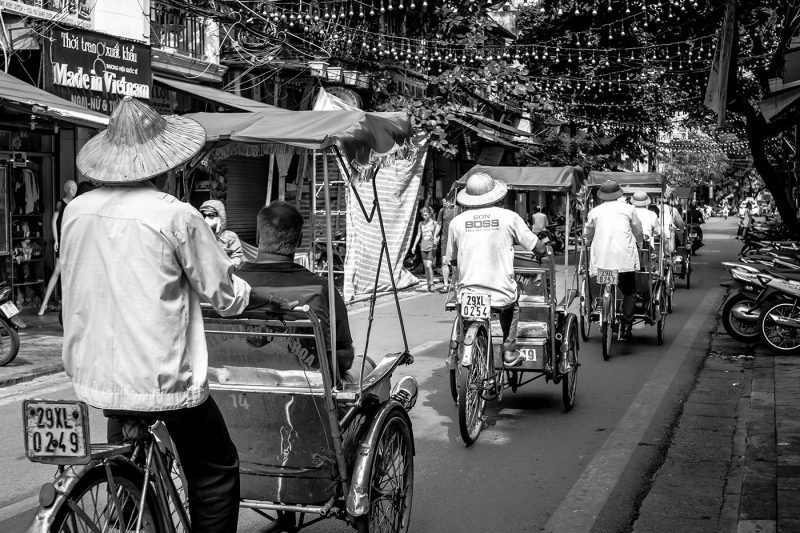 Taking a cyclo allows you to slow the pace and get let someone else decide your destination. It is a trusted and safe option and usually the drivers only source of income. Captured by one of our guides, Nicolas. Coaches are relatively cheap. Companies, such as Phuong Trang or Sinh Café, have routes that cover the coastal roads and offer some comfortable overnight buses with beds and free wifi. It is best to purchase your tickets in advance through many of the hotels or travel agents in any area. City buses are more complicated and not very popular with visitors. 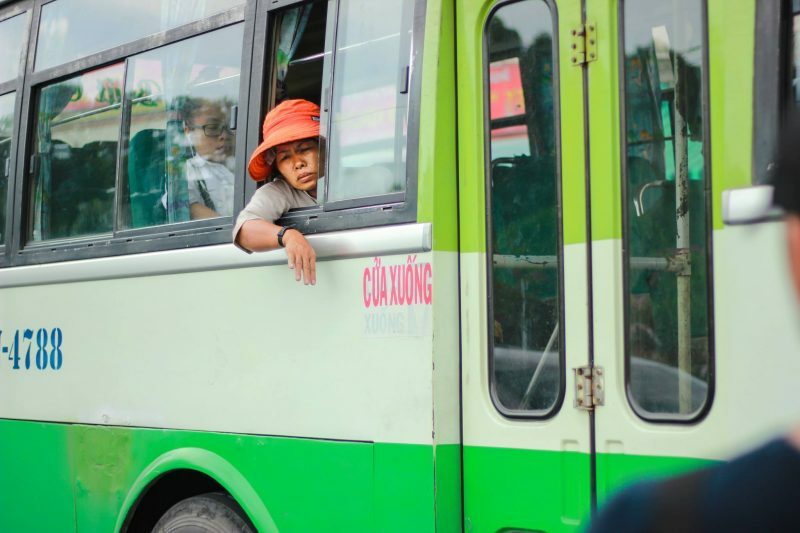 Even the locals try to avoid the slow and hot buses. 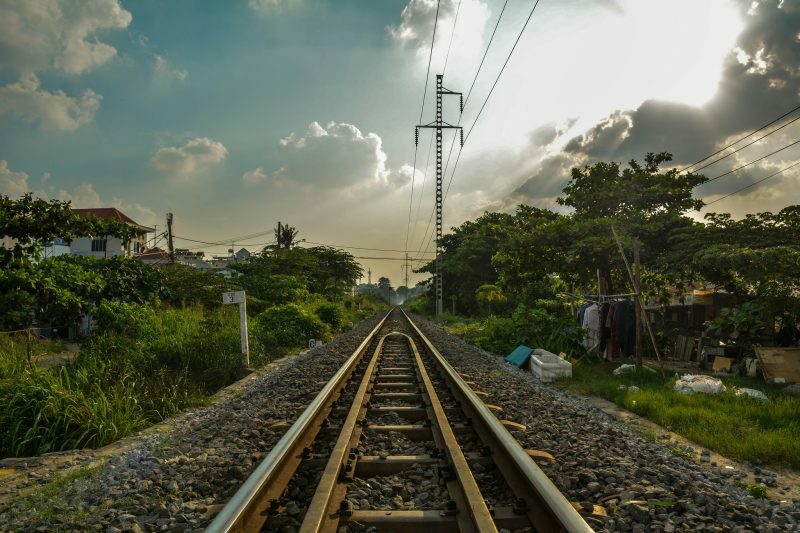 The train is the slowest way to travel and remains mostly unchanged since the Vietnam War. They can be an experience themselves though, and provide a welcome respite when you want to slow down the pace and watch the world go by. The most scenic route can be found between Hanoi and Sapa. The tracks remain unchanged since the times of the Vietnam War. 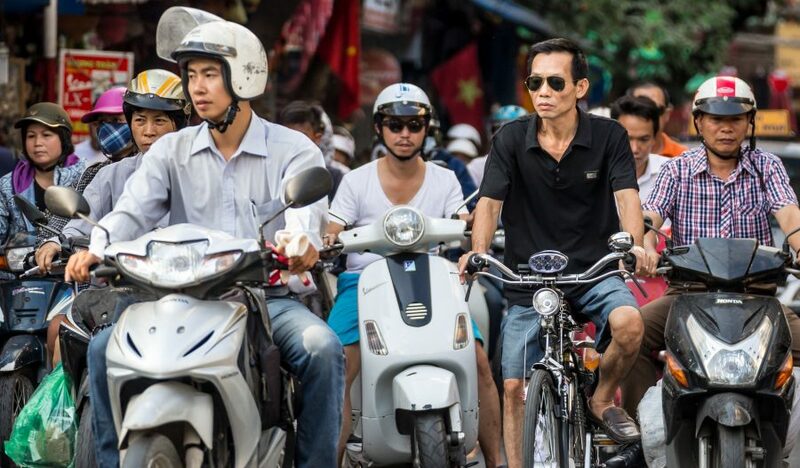 Vietnam, where the motorbike reins supreme. 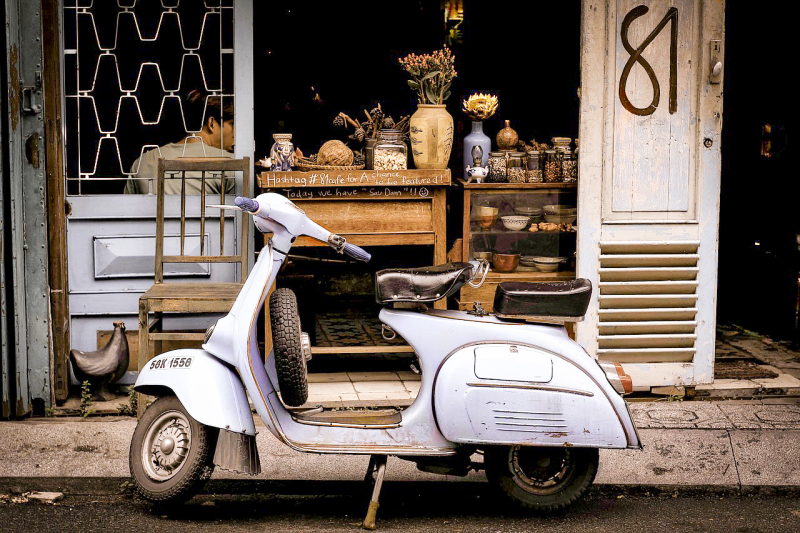 There are about 45 million motorbikes on the streets, that’s 1 motorbike for every 2 people. As soon as you step off the plane you will be hit with the roar of engines from this millions-strong army. You will be hard pushed to find somewhere untouched by the Honda Waves two wheels. The motorbike is my favorite way to get around and hopping on a motorbike is an amazing experience. In HCMC and Hanoi I find riding on the back of the bike not only beats being stuck in traffic but also helps me feel like I am part of the city. Being behind a pane of glass provides an unwelcome separation from the life of the city. It prevents me from venturing down half the streets and alleyways where the real gems of the city are to be found. Some of the best-hidden gems I have found have been from the back of a bike. If you want to experience the freedom the motorbike brings I suggest starting on the back of someone else’s bike to get a feel for it before driving one yourself. The great Motorbike Migration of rush hour Hanoi. Vietnam has a relatively fast Internet connection (except when the government announces that sharks have eaten the cables. Literally!). WI-FI can be found at a mean everywhere, on a couple of occasions now I have been shocked by little street vendors providing passwords for me to connect up. Vietnam travel tips: If you want to have the Internet while you are out and about, a 3G SIM card is extremely affordable. A $20 SIM card can last you for a month with 2GB of data. You can buy these from the large yellow phone shops “The Gioi Di Dong” around the city. The registration process is fairly complicated for foreigners so ask one of the staff members or your hotel receptionist to do it for you. 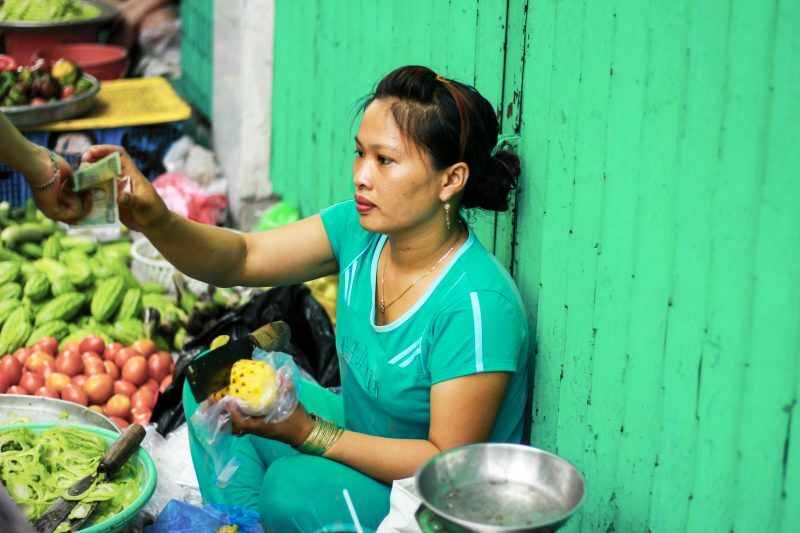 Decorating most streets in urban areas you will find a woman crouched on the floor wearing the flowing, pajama-like blouse called an áo bà ba exchanging some of the most mouth-watering local delicacies for money. Photographed by Felix Montino. Food plays a big part in the local culture. Traditional Vietnamese foods have their own rich history. Each provides a glimpse into the culture of the region that produced it. The seasonal climate in the North has brought a great variety to the dishes from there as they had to accommodate for what ingredients were available. Many of the dishes have their origins in ancient wars where they were created to maximise nutrition and energy for soldiers. Dishes from central Vietnam are spicier, the people from here think of themselves as hardened, tough enough for hot chilli. They have experienced the most hardship, both natural and man-made, having to build their villages up many times over after storms or wars. The South prefer sugar, making the saying ‘Khong duong’ (no sugar), very useful here. They have been blessed by a climate which produces abundant ingredients all year round. People from the North argue this natural blessing meant the dishes aren’t as imaginative, but I am from the South so I have to disagree, plus fish sauce comes from here, a condiment no meal in Vietnam seems to go without. The northern dish good enough for the President of the United States. Walk the streets of Hanoi during lunchtime and you will find yourself enveloped by a pall of smoke on nearly every street corner. Follow the source of this cloud to find the most tender and juicy pork over a tantalising mix of noodles fish source and herb broth. 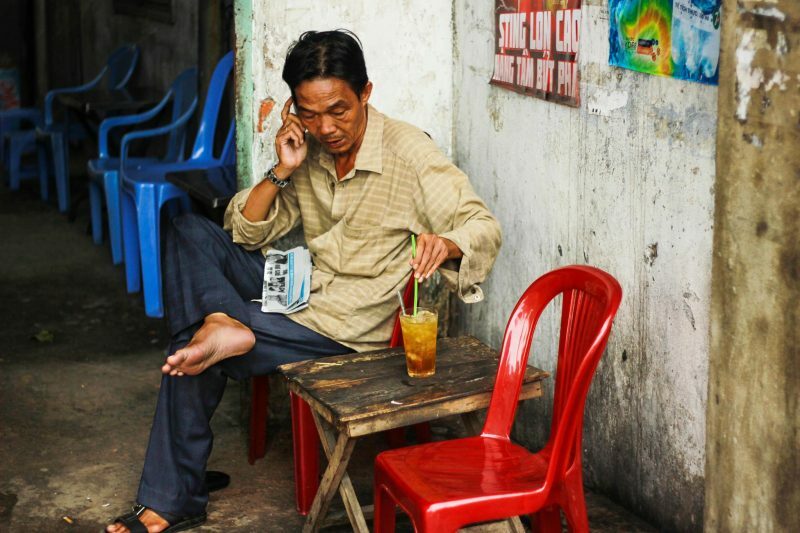 For the most authentic way to enjoy bún chả, head to the makeshift restaurants on the side of a busy pavement. It will be marked out with a felt-tipped cardboard sign hung above a gutter-level barbeque which is surrounded by a sea of blue plastic chairs. Join in with the local customers who are bent bowlward and slurp every last drop of the broth. The dish which has put Vietnamese food on the map around the globe. The growing middle class in Vietnam has created a surge of 24-hour, squeaky clean, brightly lite modern Pho Shops. However, I find this to strip the process of eating the street food of all its fun. No bowl of Pho is complete without motorbikes buzzing past an inch from your back, a rusty fan threatening to break out of its brace and fall right next to you or onto the already littered floor. 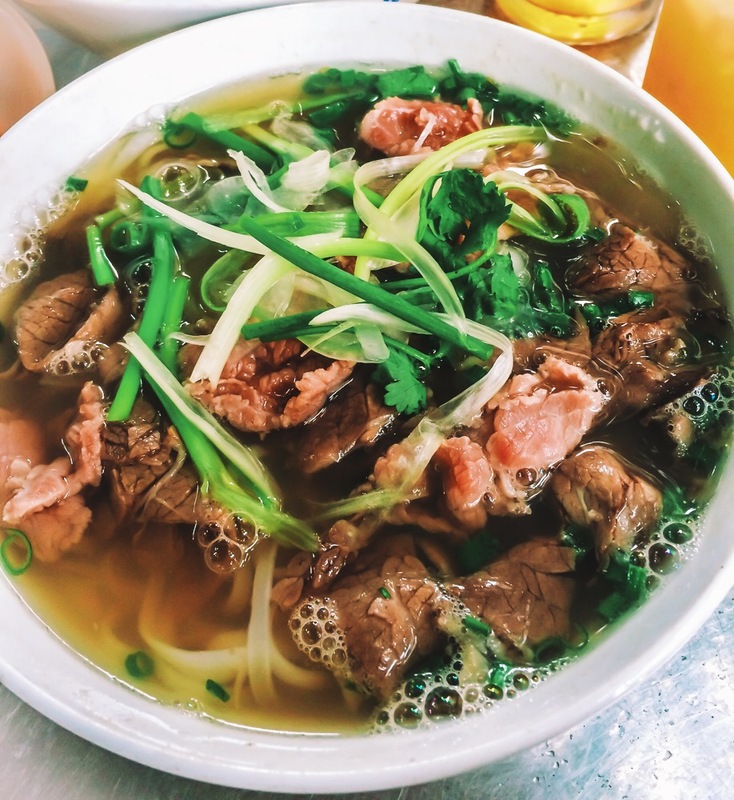 My favourite bowl of Pho can be found in the south seasoned with fresh mint as well as the usual broth of cloves, cinnamon, and star anise. 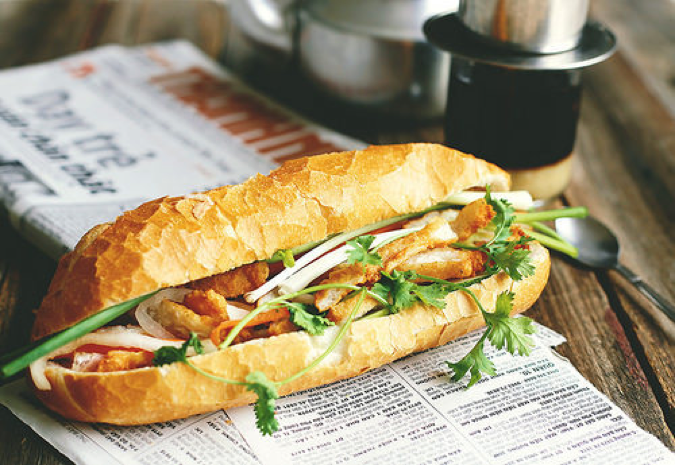 This fiery packaged sandwich offers so much more insight into Vietnamese history than its simple comparison to the French baguette. Bite into a Banh Mi and your taste buds will be set on fire as the bread diffuses into the paté, homemade eggy mayonnaise and tender sliced ham which then succumbs to the picked vegetables and kick from the hot sauce. The exotic items they brought with them did include bread and mayonnaise however the French did not hand these over willingly. The food was used as a way to insight cultural and racial supremacy. The perishable bread was the secret to keep the French stronger than the rice-bound locals. It wasn’t until the World Wars, when this supremacy was forgotten in exchange for manpower on the front line, that the Vietnamese got to even experience the baguette. It took many more years and turns of events for the Viet people to fully accept the sandwich and make it their own. Vietnam’s street food is a cultural commodity that attracts thousands of hungry tourists each year. Something which has been vastly exaggerated by the west’s growing infatuation with the Vietnamese sandwich. I truly believe the best coffee in the world is Vietnamese coffee. Don’t let the rich chocolatey taste foul you. The stuff has such a strong kick. It is frequently referred as rocket fuel. 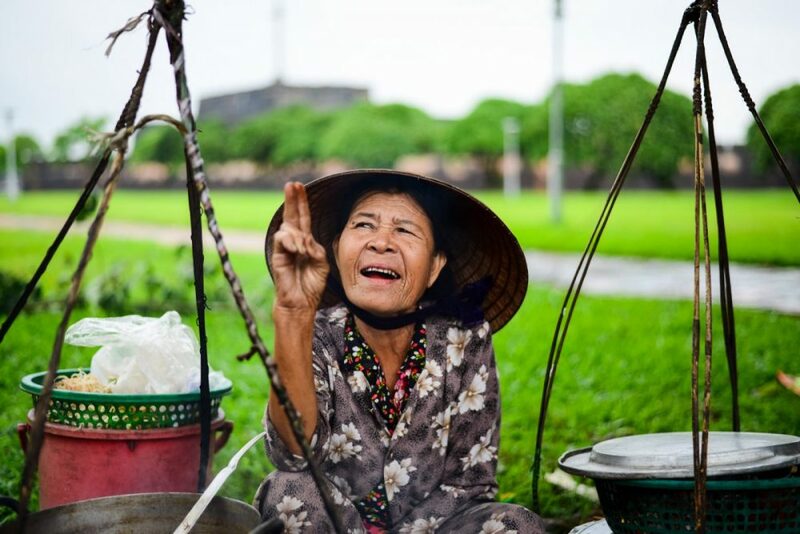 From the quirkiest hidden garden cafes to the street vendors crowding the pavement, there is no time of day which the Vietnamese find not appropriate for coffee. The cheapest coffee is found at the street vendors which usually display no sign of its sale other than a yellow icebox. All of these box vendors will stock the two traditional options: ca phe da (iced coffee) and ca phe sua da (coffee with condensed milk). Coffee shops are the backbone of the Vietnamese community. Locals meet here and take time out their day to sit and take in the world as the thick black, crude oil-like coffee drips from French style filters onto the almost-solid white base. The drink remains separated until the ice plunges in and forces black into white, bitter into sweet. Don’t miss egg coffee in Hanoi, one of the only places in the world this unique concoction can be found. Captured by Abi Travers. Vietnam is home to many a bargain. Many international companies, most notably Nike, Adidas and North Face, have their manufacturing facilities here so you can get your hands on very good quality replicas. Make sure you negotiate any price they give you because vendors normally mark up the first price they give tourists by 2 or 3 orders magnitude. With the language barrier getting the best bargain in town may be a near impossibility but you can at least get yourself some discount. For a great photo opportunity visit the early morning wet markets. This does require a very early start as they usually last from 5am-8am. This photo was taken at Dong Ba market in Hue. Vietnamese tailors enjoy worldwide acclamation thanks to the quality, affordability and speed at which they can produce almost any personalised item of clothing. Hoi An is the most famous location of the tailors, every second shop seems to offer this service. They seem to be able to turn around a suit in less than 12 hours which makes me question whether it is handmade. The quality varies so a good shortcut to find who is good is to ask what type of material and design match up – a good tailor will always know this answer. 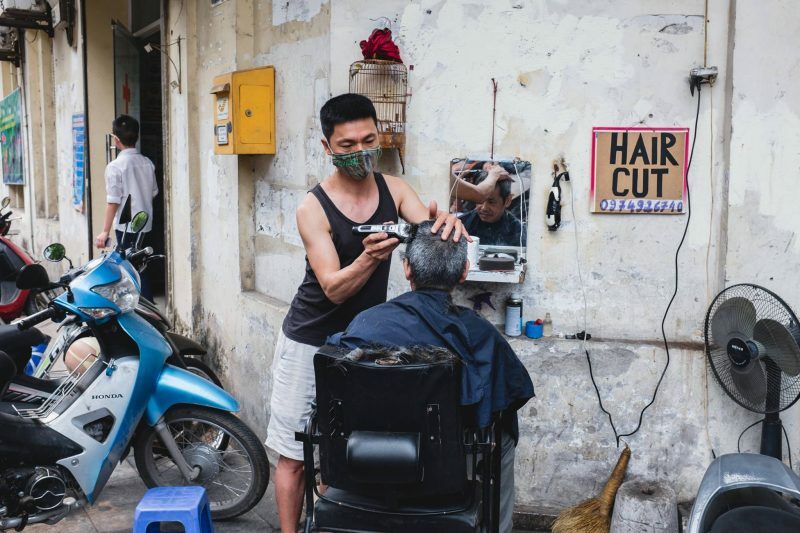 You can spot more traditional tailors along an alleyway in District 4. They do not have the capacity to make whatever you can design but they are very skilful in fixing anything and extremely cheap. Captured by Abi Travers. Are you brave enough to try one of the pop-up barbers on the street? Looking for a place with more of a Mexican Chicano, fused with hip-hop style? HCMC surprisingly has both options at very affordable price. Pampering yourself with a massage more your thing? You can find many palours all over the country. On a side note, for the best quality ones, avoid those in the tourist hotspots as many of these try and offer more than you have bargained for. Staff can be very persistent and almost aggressive in asking for a tip afterwards. You should ask the staff up front if they are paid or if they expect you to pay again in a tip. Waxing, mani, pedis and justreatment you could desire can be found in abundance and cheaply here. The quality varies but not much more than it would in any country. 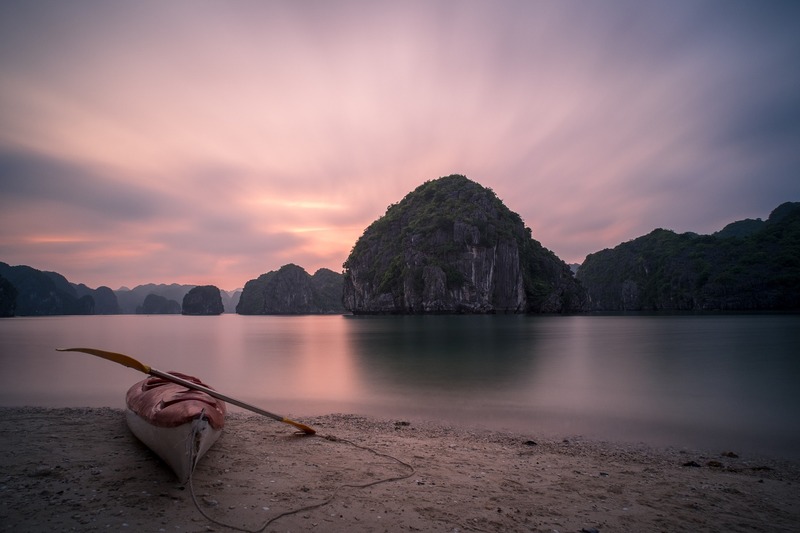 The most popular route for visitors to travel Vietnam is along the coast, starting in either HCMC or Hanoi and working their way to the other. The pearl of the Orient. 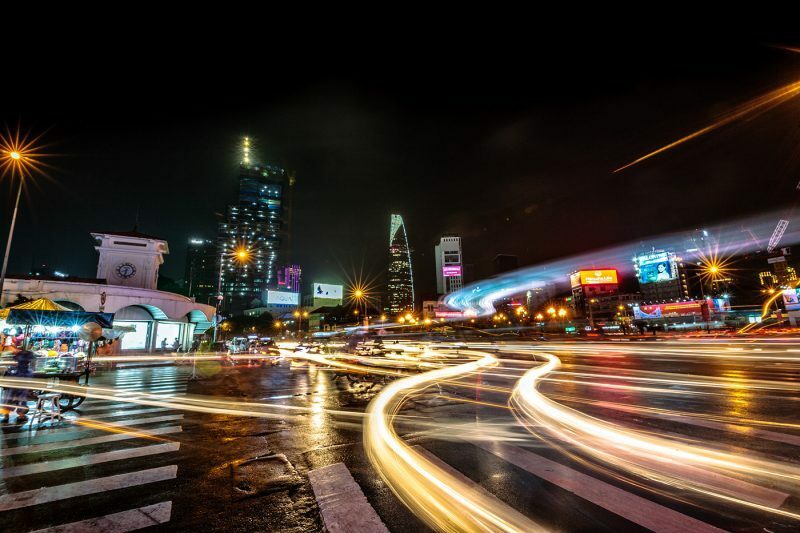 HCMC is transforming into an ultra-connected, around the clock, booming metropolis whose growth rivals that of 1990s Bangkok. Sky-scrappers are erected at logic-defying speeds with workers continuing round the clock. If Hanoi is the political capital, HCMC is the commercial one. Spending time will make you to feel part of a much larger living breathing and indeed buzzing organism. There are not many places more alive than this one. Meandering down the sleepy Mekong river, marvel at the towering mangroves, get a real sense of the southern region of Vietnam. If life in HCMC is on fast forward then in the Mekong it is on slo-mo. The Mekong was part of the Khmer dynasty hence exhibits a culture quite distinct from the rest of Vietnam. One of the top attractions in this region is the floating markets with the most famous being the Cai Rang floating market in Can Tho. 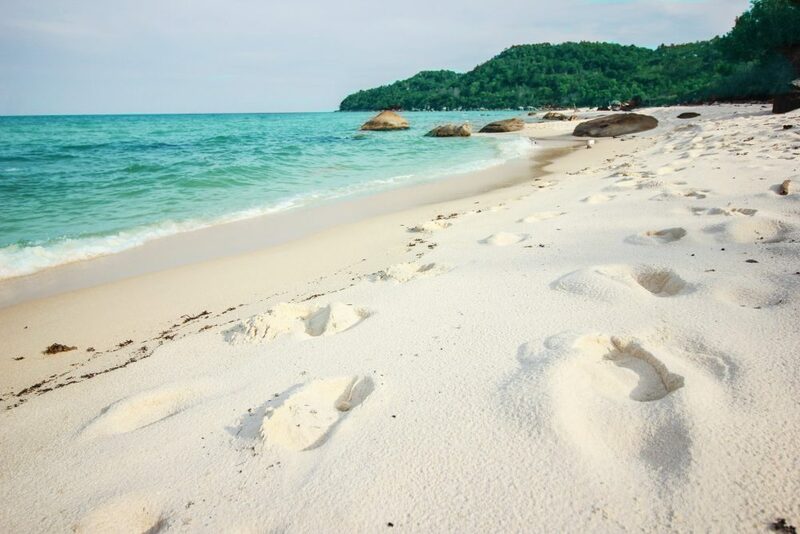 Only an hour’s flight from Saigon, Phu Quoc Island has some of the best beaches in Vietnam. It is the perfect escape spot. Everything here seems to be intact. The villages have all the hallmarks of traditional Vietnamese fishing towns. Hire a motorbike to drive around the island and find the best-hidden beaches. This is a small fishing town approximately 3-hour drive from Ho Chi Minh City. With a long stretch of beautiful beaches, it is the top destination for a weekend getaway for the residents of HCMC. 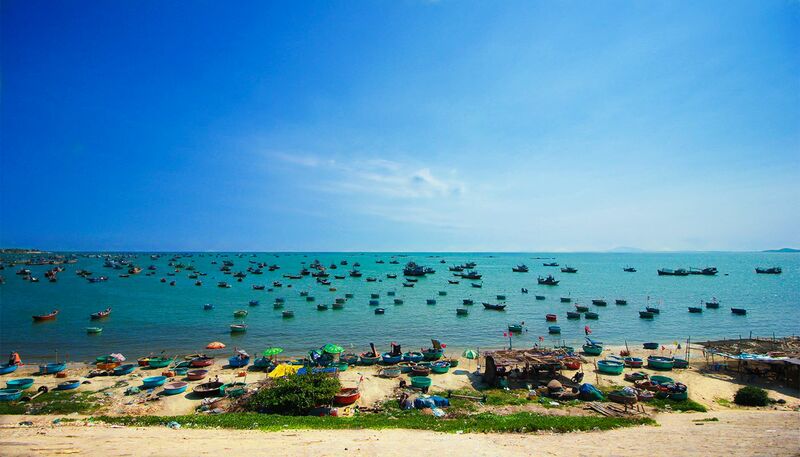 Phan Thiet fishing village in Mui Ne. Dalat seems to be local favourite thanks to its green landscape, European-style architecture, pleasantly cool temperature and organic farming. Surrounded by hills, lakes, and waterfalls, Dalat is an ideal spot for hiking, rock climbing, and other outdoor activities. Just outside of Da Lat is some of the most scene countrysides Vietnam has to offer. 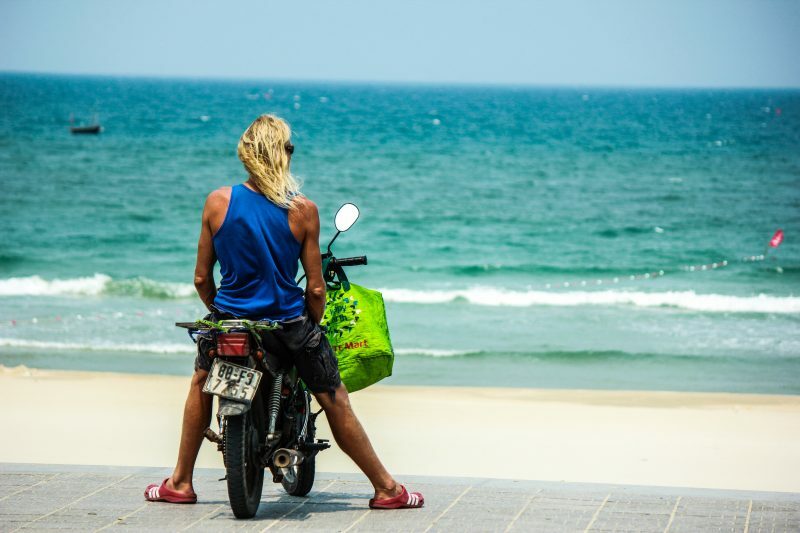 Following in the Top Gear footsteps, many people chose to motorbike along the coast of Vietnam. Nha Trang is a good place to begin this journey if you want to avoid the hectic traffic around HCMC. If you are a beach person, Nha Trang is the place to be, thanks to its long crystal clear beaches, beautiful islands, and tons of activities. However, in the recent years, many hotels have sprung up along the front and it is a cheap and easy place for Russian package holidays to be located. If you want to avoid these type of crowds, it may be best not to spend. Hoi An is a must-visit. This charming ancient town is well-known for its influence from the Chinese and Japanese which culminates in a very distinct prehistoric architecture. It is home to the best traditional Vietnamese food and talented tailors. Interestingly, the tailors there can custom anything in less than 12 hours. 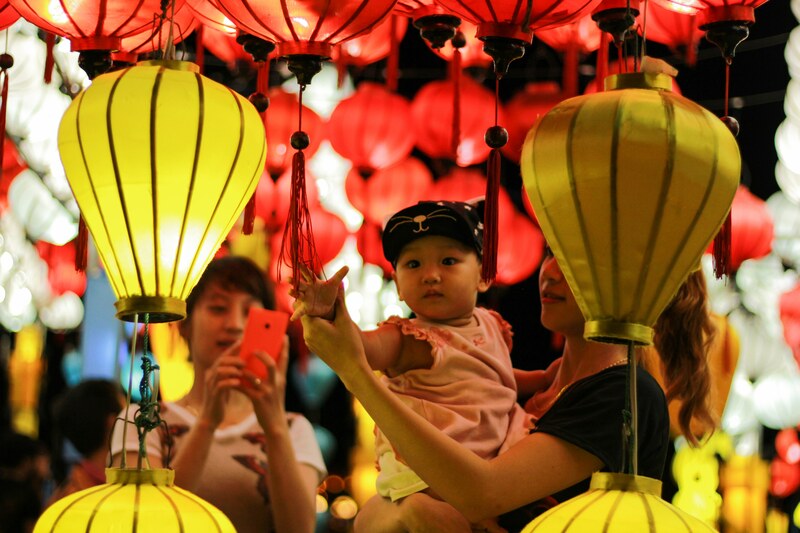 Hoi An is decorated in lanterns all year round. Captured by Abi Travers. The birthplace of Vietnam, Hanoi’s history and culture have spanned thousands of years. 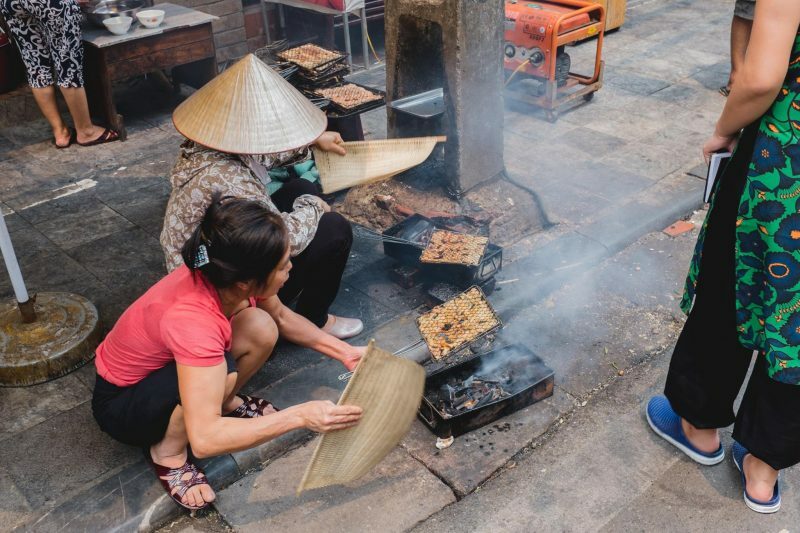 Hanoi is now known for its French colonial architecture, street food which is more diverse than any other place in the world and traditional Vietnamese lifestyle. Discovering Hanoi’s hidden gems will require you to be more adventurous than just following a group of tourists or flipping through the Lonely Planet. Hanoi captured by one of our guides, Nicolas, while he was traveling on the North of Vietnam. As a UNESCO World Heritage Site, Ha Long Bay is famous for its stunning limestone outcrops, natural caves, and hidden bays. It has been the subject of many films including James Bond. Sunset on Ha Long Bay. Sapa is a small town located in the north-west of Hanoi. This beautiful town’s nickname is “stairway to heaven” thanks to its foggy weather and scenic mountain landscape. It is home to Fansipan, Indochina’s highest mountain, and some of the most scenic mountainous roads in the country. 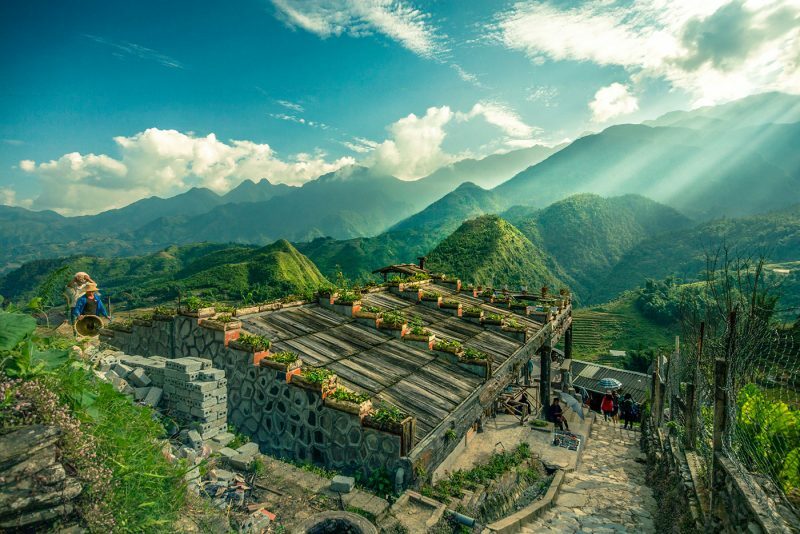 To relish the magnificent beauty of this highland to the fullest, a Sapa homestay experience is highly recommended. Ninh Binh is the ancient capital of Vietnam. You can explore Tam Coc national park in Ninh Binh. The limestone outcrops, long deserted roads, windy rivers covered in mist will make you feel like a true explorer. My favourite thing to do here is to hire a bicycle and go find the hidden temples. I must admit sometimes I wasn’t sure what would be in the mist or behind the next limestone boulder. There is no surprise this place is the new home of King Kong (Kong: Skull Island). There are a few temples in the Limestone outcrops at Tam Coc. Visiting Vietnam? Looking for a local to show you around? 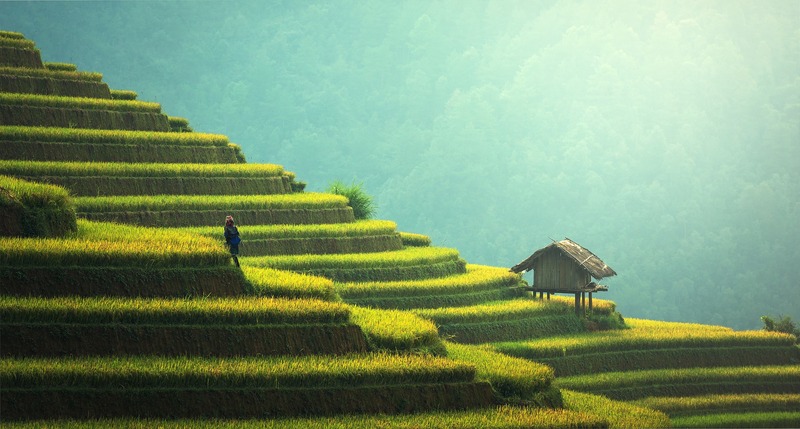 Check out Inspitrip and connect with a local for insight all the best parts of Vietnam. Time to go and weather depends on region. Rains May to Nov in far north or south. In Central areas Sep to Dec. Your website is so helpful. Vietnam has lots of amazing destination. You can take a look at a website: journeyonair.com. I think it useful to you. Thanks for the information that you gave. “Hello. I’m looking for advice on how long to spend and where. I plan going for 10 days beginning April with husband. Also how much money would we expect to spend for 10 days for accomodation food etc staying in at least 3 star accomodation. All advice greatly appreciated as we have never traveled Asia only.